Daily dog walks are one of life’s sweetest pleasures. But a dog who is unable to walk on a leash properly can make that experience miserable. Train your dog to walk on a loose leash, pick the right spots and enjoy your time together. 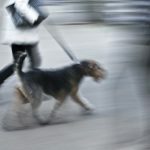 Make the most of daily walks: Pick a fun place, set a reasonable pace, and keep your dog on a loose leash. 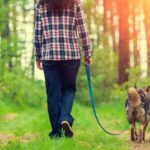 Walks boost fitness for dogs and owners: Everyone knows your dog needs daily exercise. But research shows owners benefit from walks just as much as their dogs if not even more. Find your spot: Make daily walks count. Find out where your dog likes to walk best — park, beach, woods or school. Eliminate leash aggression: When stressed, dogs who don’t know how to walk on a loose leash exhibit leash aggression. Nervous dogs will instinctively revert to a fight or flight mode. 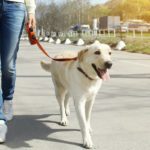 Dog walking benefits: Walks provide great exercise, bonding and training time. They also give your dog the skills to find his way home if he gets lost. 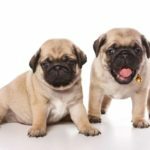 How much exercise does a Pug need? A Pug should have at least two 20-minute sessions of exercise per day. Moderate exercise is crucial to help maintain the Pug’s weight. 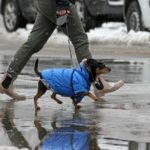 Winter dog-walking safety tips: Keep walks short, protect your dog’s feet, wear warm and reflective clothing, and be aware of cars and other hazards. 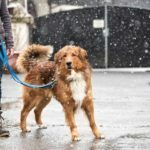 Winter dog-walking tips: Keep walks short, protect his paws, dress your dog warmly, and make sure your dog gets plenty of food and water. A favorite spot for dog walks: Make your daily walks count by finding out where your dog likes to walk best — park, beach, woods or school. Try to take daily dog walks. Pick a place that’s fun for both of you, set a reasonable pace and keep your dog on a loose leash. 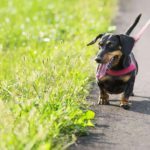 The folks at DogBuddy.com decided to compile dog walk info by surveying more than 1,000 dog owners across the United Kingdom. 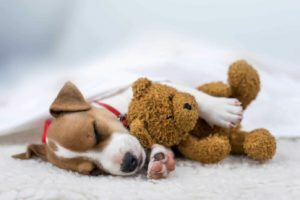 Among their findings, most dog owners usually walk in the morning and tend to walk alone. Joshua McCauley started Trip Less Trainer and created a shorter leash with a thumb tab that he says allows the trainer to provide consistent control. 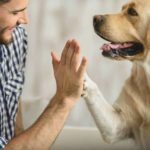 Dogs need companionship, exercise, training and affection.Work with a reputable dog trainer or behaviorist to correct dog aggression. 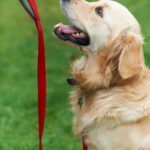 Before walking multiple dogs, begin by training each dog to heel and walk on a loose leash. Once you have control, begin adding additional dogs. When stressed, dogs who haven’t learned to walk on a loose leash will instinctively revert to a fight or flight mode and exhibit leash aggression. 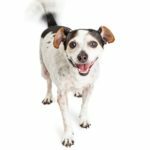 Take your dog on a power walk where you are in control and your dog is a relaxed follower. That lets the dog experience the full benefits of exercise. Dog walks boost fitness for dogs and their owners. 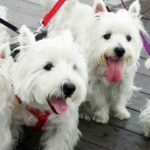 In fact, studies show the walks might even provide greater benefit for the owners.